Kitchens are one of the most popular renovation projects for homeowners for a good reason. We spend much of our time in this hub of the home, and cabinet and countertop trends change with every passing decade. Two of the most popular options for countertops are granite and concrete. We describe the pros and cons of each so that you can make an informed decision for your home. Granite is quarried from the ground and cut into slabs for countertops. It is composed mainly of quartz and feldspar with a mixture of other minerals. Because it is a natural stone, each piece is unique. This means that your countertops will inevitably have some variation in color and pattern. Many people like the natural stone appearance of a granite countertop. However, you are limited to the color and pattern options of the natural stone. Granite tends to be dark, and that defines your decorating choices for as long as you keep these countertops. Concrete is mixed and cast from cement and aggregate and polished to a smooth surface. This process makes it possible to create a countertop in any shape and color. Rather than cutting out holes for sinks and other built-ins, the form or mold is built to accommodate them. The concrete can be colored when it is mixed or after it has cured, allowing for an unlimited palette of color and pattern. Objects such as colored glass or seashells can be embedded in the slab for additional visual interest. 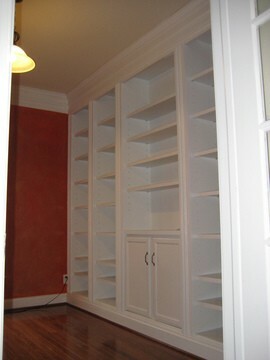 This gives you maximum flexibility in your decorating options. 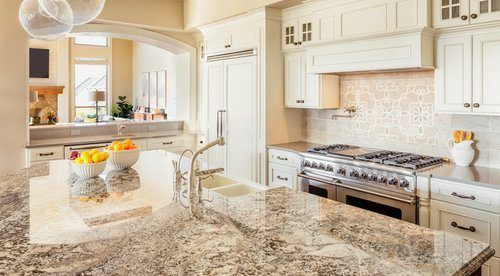 Professionals should install both granite and concrete countertops because the material is heavy and requires specialized equipment to fabricate and install correctly. Once you select your granite countertop slabs, they will be shaped and finished to fit your cabinets and cut-outs for sinks and other built-ins 1. They are then transported to your home and installed. The process from selecting the slabs to completed installation may take up to two weeks. Concrete countertops can be created in place in your kitchen, but they are usually cast separately and then installed. A mold for your counters is created, including all cut-outs and built-ins 1. The concrete is poured into the mold and is troweled smooth and left to cure for up to a month. 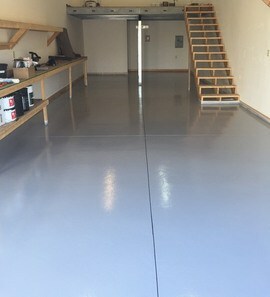 The final step is polishing the concrete to a shine. Standard granite slabs range in price from $40 to $75 per square foot, although exceptional pieces can cost as much as $500 per square foot. Installation adds another $330-$500. Cutting and finishing edges costs around $10 a linear foot, totaling $300 to finish one edge and $1,200 for all four edges. This makes the total between $3,000 to $3,500 for a 30-square-foot countertop. A concrete countertop can cost a lot less than granite if you do it yourself, but it is a long process requiring specialized equipment. So, it is best left to professionals. For 30 square feet, the materials cost about $2,000. Labor adds between $140 and $330, and additional supplies cost up to $80. The total cost ranges from $2,220 to $2,410. Both granite and concrete are more heat-resistant than laminate countertops or even surfaces such as quartz. However, placing a hot pot directly on a concrete countertop can damage the sealant that protects it from stains and spills. It is recommended that you always use a trivet to protect your concrete countertop. Sealed granite is much more heat-resistant than sealed concrete. Both concrete and granite are tough materials that resist scratching. However, granite requires less maintenance than concrete over time. 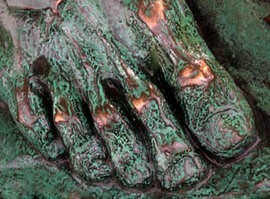 Even when polished to a smooth surface, concrete is a porous material. This creates two potential problems. It can stain easily and harbor bacteria and mold. You may not even notice this as it can develop under the surface. To prevent the problems, concrete must be sealed every 1 to 3 years and waxed more frequently, possibly on a monthly basis. Even when properly sealed and maintained, concrete develops an irregular patina 2 from spills and regular wear. Small cracks may develop but can be patched. Granite is also a porous material, but it does not require as much ongoing effort to maintain a sealed surface. After an annual application of sealant, you do not have to perform any further maintenance tasks. It should be cleaned with only soap and water, and spills should be wiped up promptly to prevent staining. Small chips can easily be repaired with epoxy 3. Both granite and concrete countertops have a relatively large carbon footprint. Unless you live near a granite quarry, your granite countertops must be shipped from their place of origin to your home. This may be thousands of miles. On the other hand, the manufacturing process for concrete uses a lot of energy as well. Granite is practically indestructible and will last a long time, but it is not a renewable resource. Concrete can also last for decades, and in addition, it can incorporate recycled industrial waste such as fly ash from coal furnaces and slag from iron production. This makes concrete the greener choice. Both granite and concrete are excellent options for countertops for outdoor kitchens, which are one of the popular additions for today’s homeowners. Once sealed, these countertops resist stains and hot pots as well as the weather. However, in very cold winter climates granite may crack. Concrete is also very durable, and while it needs to be sealed periodically, it can be formulated to withstand winter freezes better than granite. How much does it cost to install butcher granite or concrete countertops in my city? Cost to install butcher granite or concrete countertops varies greatly by region (and even by zip code). To get free estimates from local contractors, please indicate yours.